I was very excited to receive my copy of the Hey Mama! Print Schoolhouse Planner 2016-2017, a new planner from The Old Schoolhouse. Even though this planner doesn't begin until July, I already jump-started my planning for next year. There are a ton of great features in this planner, and I plan to use it as my main homeschool planner for next year. Not only does it give me plenty of room to organize and plan, but it is filled with so much motivation from the Hey Mama! letters that are written throughout the planner. Let's just break this planner down into the sections, so that you can get a feel for the flow. At the very front of the planner, there are yearly at-a-glance calendars for 2016, 2017, and 2018. So far I have circled my birthday and my daughter's birthday. 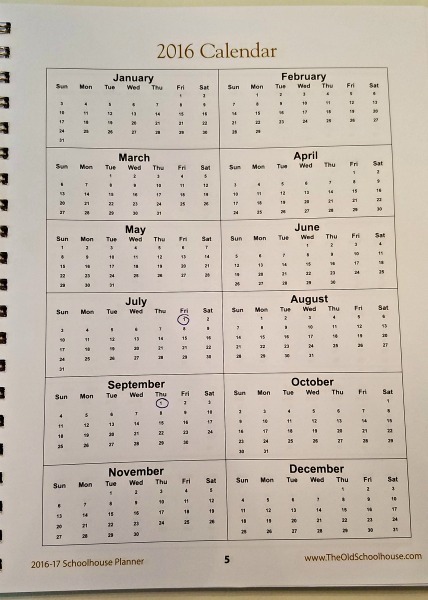 I plan to get the other birthdays circled, our anniversary, and highlight some holidays so that I know when Daddy will be home. 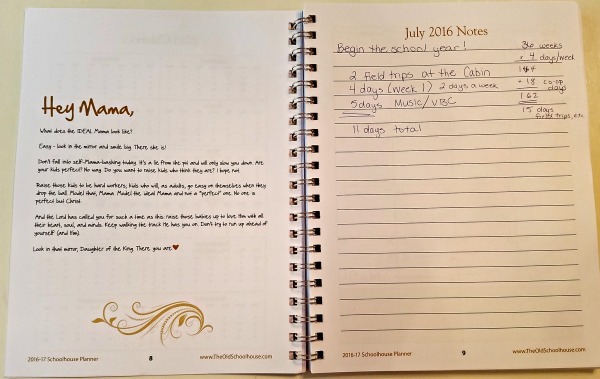 The monthly planning is great because not only does it include a full two-page calendar, but it also includes a notes page and a wonderful Hey Mama! letter for each month. Talk about inspiration and a little pick-me-up! There is plenty of room to add notes, thoughts, journal ideas, goals, etc. I love how big the boxes are. This will come in handy during the busy school months. There is also a section on the side to jot down notes! Each month has a Hey Mama! letter, notes page, and a two-page spread. I will be adding some tabs along the side for easier flipping through the year. My favorite part is the planning pages. There are 36 blank lesson plan pages for you to use. After every four weeks there is another Hey Mama! letter and a page with an interesting fact on it. 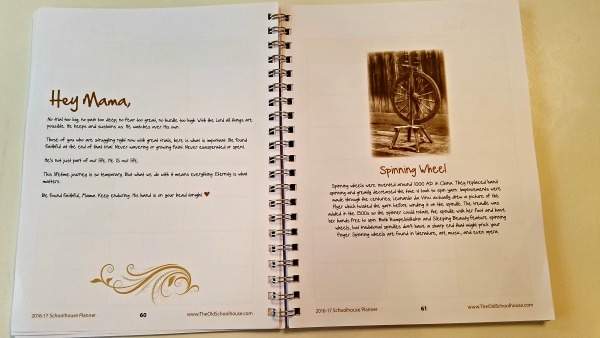 Not only is this planner helping you to be motivated, calm, and organize, but it is feeding your brain too! This is the Hey Mama! letter and fact page that is thrown in every four weeks of lesson plans. It's a great time to reflect and remember why you are homeschooling in the first place. I have two children, so I color coordinated the lesson plans for my two kiddos. 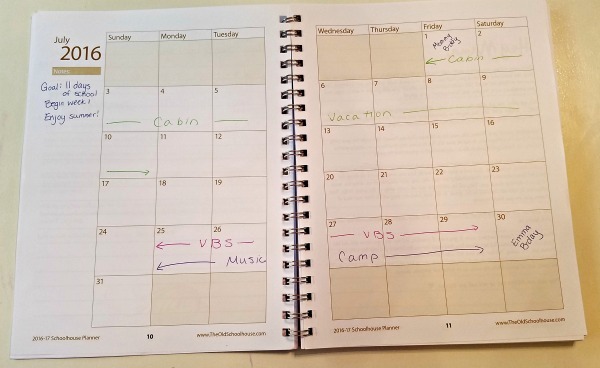 We school four day weeks with the fifth day being a co-op day, field trips, or an unschooling day so there is plenty of room in the planner for all our plans for the week. I also like having space to write in any supplies I need for the week. I only wrote in our first week of school since we aren't starting next year until July, but boy am I motivated to get started now! 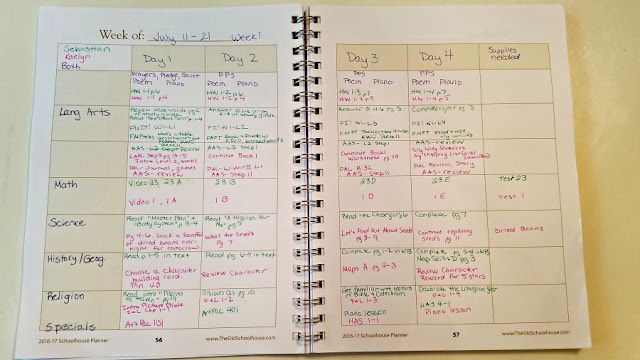 At the back of this planner are a bunch of useful homeschool forms including: Monthly, Semester, and Yearly Goals; Attendance Charts; Books Read Through the Year; Curriculum Planning Sheet; Homeschooling Contact List; Writing Prompts; Story Starters; 5 pages of facts; Transcript help and more! I have most of our curriculum purchased by now, but it is nice to have it all listed in the book. I also have a 2-page spread of Kaelyn's curriculum and there is still one more blank page left over! I love how much room they give us in the planner. I started working on some of our yearly goals. 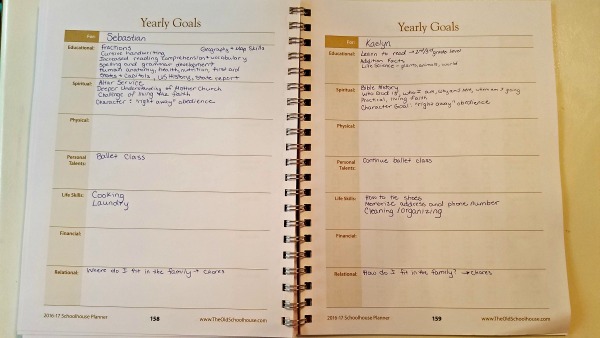 The monthly and semester goals look the same way, but it is a way to focus on one skill at a time. 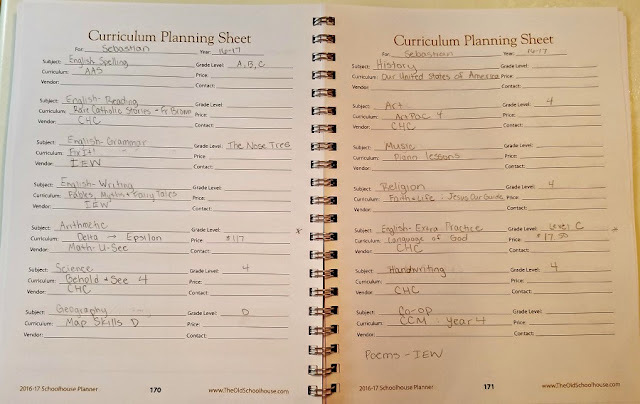 This planner was made with multiple children in mind because most of the forms have multiple pages that you can use for all your kids. I am looking forward to using this to plan my whole year! Price: $29 USD for the print copy. $19 for the digital version. Until July 15th, use coupon code CREWCODE which will get you $10 off the print copy as well as free shipping!